This multimedia source was a very emotional story and as the saying goes, “A picture is worth a thousand words.” With the numerous photographs provided, the reader gains almost twenty thousand words. The photographs leave a very appalling view of the tragedy. Some photographs were very eye catching, whereas others left me questioning. For example, the fourth photograph made me question how the photo related to the story. If it weren’t for the caption, I would have thought that the photo was insignificant to the story. The first photograph has no leading sectors to the subject, nor does the photograph follow the rule of thirds. However, the photograph draws so much emotion from the viewer due to the expressed tragedy of the incident that I think the photograph is exceptional. It’s easy to use leading sectors in a photograph, as well as following the rule of thirds. However, capturing emotion in a photograph is extremely difficult. I also thought that the audio which was used brought out more emotion in the viewer. Reading the story allows you to interpret the story your own way. Hearing the story being told by a narrator helps to create the emotion the author was striving their reader to feel. This story was very powerful and brought out sincere despair. Another article I found, which I was impressed by, was from the NY Times regarding inmates who are released and left to be on the streets alone. 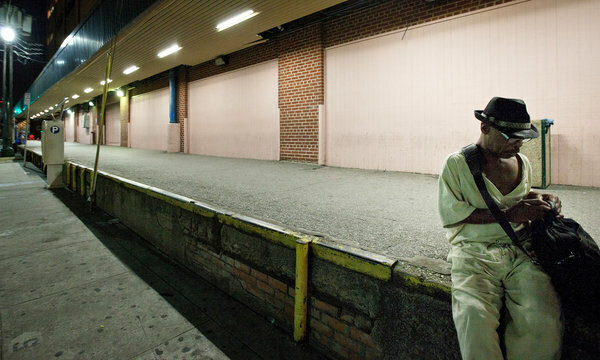 Here is the photograph which was displayed in the article "Out of Jail and Onto the Streets, Alone, In the Wee Hours." The photograph in this article was very powerful and relates strongly to the story. The leading sector, which is the yellow curbing, draws the eye to the subject. I think the leading sector represents his past and where he has been. The photographer remarkably followed the rule of thirds. I think using the rule of thirds to such a dramatic effect really implies to the viewer that his past is clear but his future is uncertain. As I said previously stated, a picture is worth a thousand words. This photograph gave the viewer a clear idea of what the story was about and evoked strong emotions as well. Not only was the photograph evoking, but the writing was as well. However, readers who want to scan the article to gain information may have a difficult time selecting the most significant portions of the article and become frustrated with the extensive length. Since both my “good” articles where found from NY Times I was intrigued to find an article from that source that did not impress me. UnfortunatelyI did! The writing was of well length, just as the previous two. There were several related story articles found, creating substantial ease for the viewer. However, there was only one link which was embedded in the article. 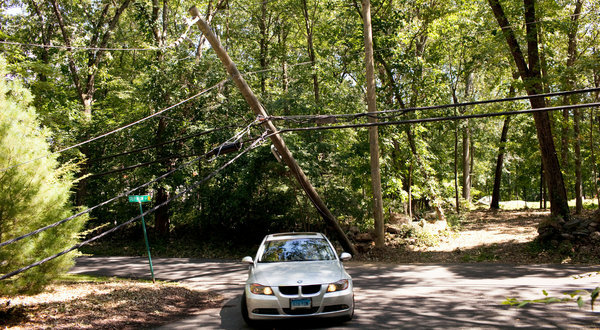 Here is the photograph from the NY Times shown in the article "Days After the Storm, Many are Still in the Dark." This topic is emotional and affecting thousands of people, which disappoints me that the author didn’t do more to evoke such emotion, like the other two journalists. I was also dissatisfied with the photograph that was displayed in the article. The subjects in the photograph are hard to select, because either the car or the pole could be the subject, which made the photograph unappealing to the eye and difficult to interpret. Although the writing in this article was decent, I think the photographer could have found a much more evoking and eye appealing image.